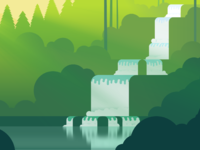 Another waterfall, although I'm not finished with this one. It's going to be a backdrop for a little story I want to tell. In the meantime check out the attachment for a better quality still. Waterfall Trying out a more minimalist style, tell me what you think?